The National Disability Insurance Scheme (NDIS) can help kids, teens, and their families access much-needed support and services. Scope can guide you through the NDIS process. The NDIS program pathway for kids and teens ensures that school-aged kids can access services that will enable them to reach their goals. 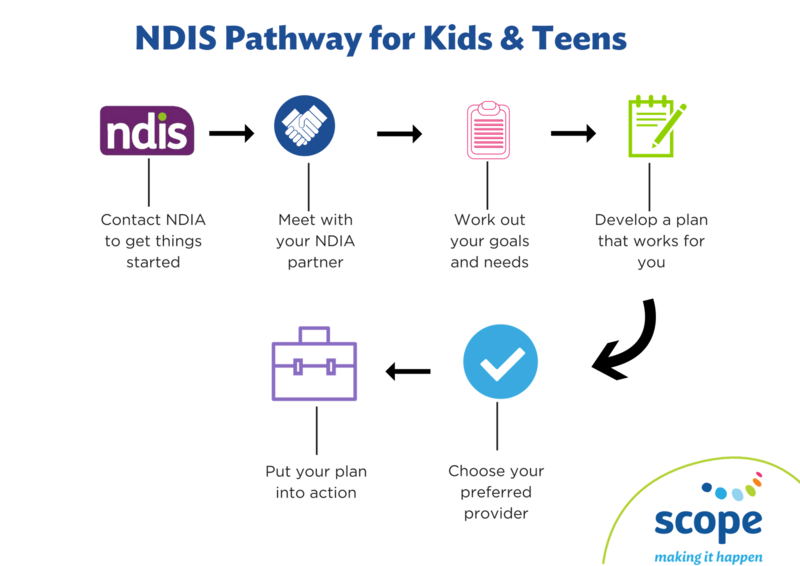 Here’s a quick overview of the NDIS Pathway for kids & teens. Contact the National Disability Insurance Agency (NDIA): The NDIA will get the ball rolling for you. If you’re already getting government assistance then you should automatically receive the information you need to transfer to the NDIS. Meet with an NDIA partner or planner: Your NDIA partner will get to know both you, your child, and your personal situation. Work out needs and goals: After spending time with your child, your NDIA partner will better understand the support and services your child needs to help reach their goals. Develop a plan for your child: Your NDIA partner or planner will help you develop the plan and submit it for approval. The plan will outline the services and support to meet the needs of your child and help them achieve their goals. It will include everyday support such as that received from your family and friends, community support, support from your child’s school or doctor and funded support to access services related to your child’s disability. Select your preferred provider: Research and shortlist your preferred service providers. Find out more about Scope’s special services to support the child’s growing years. Turn the plan into actions: Scope will work with the NDIA to manage your plan including the funding needed to access services and support.